Hello, Could you please anyone share the experience of this camera, if work fine in Netcamstudio, this camera is Onvif compatible and has a good price, I intend to buy 2 cameras! 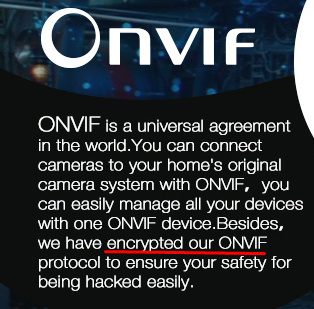 encrypted ONVIF. What is that? How is that decoded? Camera do not support rtsp protocol which onvif use. Do some more search on this and see what you find. Thanks for your feedback. Could you recommend any cheap camera outdoor WiFi Onvif compatible in NCS ? Usually, cheap cameras give you and finally me a lot of headaches. So no recommendation. However, search for cheap in the category for Network cameras and you will find cameras. If you find something on the Internet the cameras should support ONVIF and the rtsp protocol. When you find something do a search for that camera and rtsp and you will find peoples opinions. It is not necessary to support ONVIF, but hen it must have an URL like rtsp://xxxx so it can be connected using the tab for Custom URL. I use SV3C cameras, they are around $39 and have good quality picture.